Storm boy and his father live alone in a humpy among the sandhills between the Southern Ocean and the Coorong – a lonely, narrow waterway that runs parallel to a long stretch of the South Australian coast. 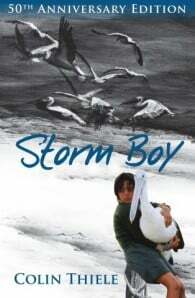 Among the teeming birdlife of the Coorong, Storm Boy finds an injured young pelican whose life he saves. From then on, Storm boy and Mr Percival the pelican become inseparable friends and spend their days exploring the wave-beaten shore and the drifting sandhills. Mr Percival learns to help Storm Boy’s father with his fishing and warn the other birdlife whenever poachers are coming, but his part in rescuing a shipwrecked crew leads to great changes in Storm Boy’s life. Colin Thiele was born in Eudunda in South Australia. He was educated at several country schools including Kapunda High School before studying at the University of Adelaide, graduating from the university in 1941. He served with the Australian Army and RAAF attaining the rank of corporal during World War II and later taught in high schools around South Australia, including Brighton High School. He taught at Wattle Park Teachers College as an English lecturer and spent time at Murray Park College of Advanced Education as Principal. He then took up a position as Director of Wattle Park Teacher’s Centre from which he retired in 1980. Thiele wrote more than 100 books, which often described life in rural Australia, particularly the Coorong region of coastal South Australia. Several of his books have been made into films or television series, including Sun on the Stubble, The Fire in the Stone, Blue Fin and Storm Boy. He was also a poet, playwright, adult novelist and teacher. But it was as a children's writer that he was best known. Storm Boy, published in 1963 is "regarded as an Australian classic". Colin's first major work was Sun on the Stubble published in 1961 and was based on his boyhood in the Eudunda region. This novel which has never been out of print, and Storm Boy, published in 1963, are perhaps his best known and most loved stories. Both have been made into films, as has Blue Fin, which is based on the tuna fishing industry in Port Lincoln. In 1977 he was made a Companion of the Order of Australia (the highest level of the award) for his services to literature and education. Thiele had suffered from severe arthritis since 1955 and in his later years left South Australia to settle in warmer conditions near Dayboro, Queensland. In 1986, he returned to South Australia for a family (the Wittwer family) reunion organised by Cheryal Wittwer, after which he returned to Queensland. Can I Call You Colin, an authorised biography by Stephany Evans Steggall, was released in March 2004. Colin Thiele moved to Queensland in 2000 for his health, but continued his writing. He died 4 September 2006, aged 85. Mr Dumby's Duck was his last published book. He was survived by his wife, Rhonda, two children, seven grandchildren and one great-grandchild. The Thiele Library at the Magill campus of the University of South Australia is named after him, an honour which predates his death by many years. The Senior Student Shared Library at the Golden Grove Campus is also named in honour of him, as is Thiele Primary School.